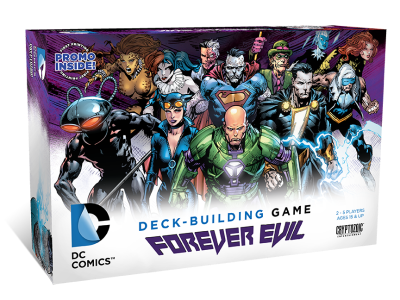 Cryptozoic Entertainment, Warner Bros. Consumer Products, and DC Entertainment have announced the third installment of the successful DC Comics Deck-building game franchise, Forever Evil. Fans can play the game as the most infamous Super-Villains in the DC Comics universe. This highly anticipated expansion to the DC Comics Deck-building game line offers up new tactics, more dangerous Attacks, rugged Defenses and dozens of unique ways to challenge opponents. 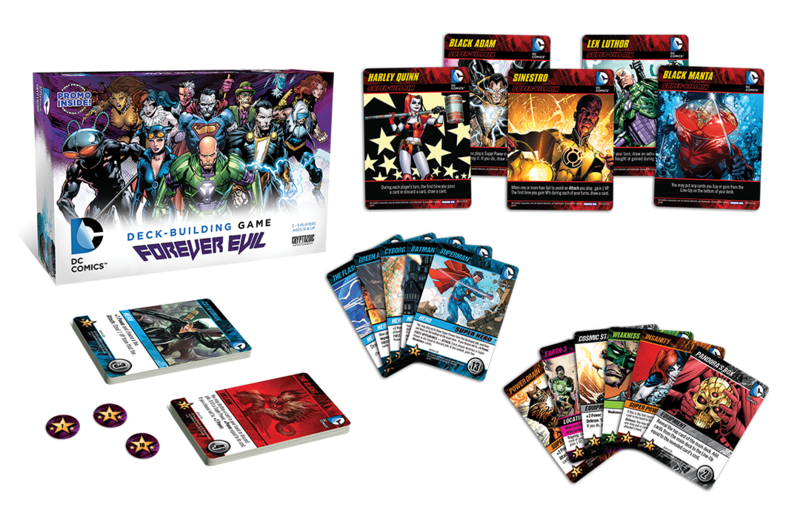 Forever Evil also introduces Victory Point tokens to the DC Comics Deck-building Game. Now earn Victory Points throughout the game. Strategize as a favorite Super-Villain, then turn the tables on the Justice League and other Super Heroes. The Forever Evil Super-Villain theme takes the treachery to all new heights. It’s fun to be bad! Forever Evil can be played as a standalone experience right out of the box. It is also fully compatible with the original DC Comics Deck-building Game and the second DC Comics Deck-Building Game, Heroes Unite for even more complexity of play.